HBC has proven to be one of the beauty stores that frequently treat their consumers rather frequently. I got word that they'll be on sale starting tomorrow! Items on sale will include soaps, hair coloring and styling products, galenicals, facial cleansers, makeup and scents. 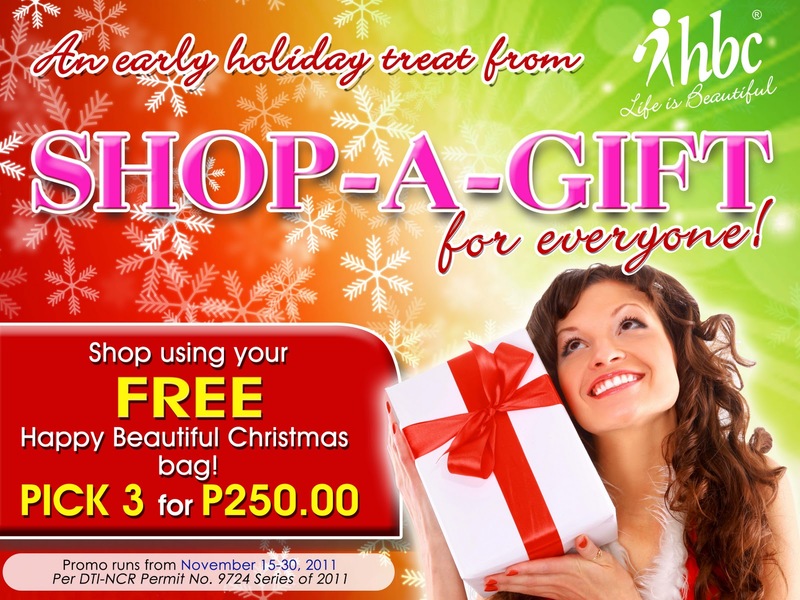 Any 3 items from these SALE treats will cost you 250php, plus, you get a FREE environment-friendly Christmas tote! Also, if you'd love to get your hands on Hortaleza Professional products, you can join these bloggers' giveaways: Thiamere's, Aya's, Dawn and Tracy's, and Kumiko Mae's! To get updates on HBC's latest sales and promos, visit their facebook and website. OO ba, i'd love to! :) Are you coming home for the holidays? Lemme know! uy meron na daw SM Masinag, malapit ka rin ba dun? i am!